The opposition Congress on Tuesday claimed that in the Lok Sabha elections next, the people of India would be on one side, and only Prime Minister Narendra Modi and BJP president Amit Shah will be on the other side. 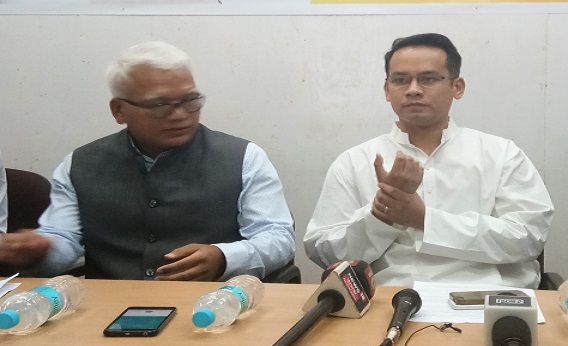 The Congress came out with this prediction through its national spokesperson and Congress MP from Kaliabor constituency in Assam Gaurav Gogoi while addressing media persons in Shillong on Tuesday where he termed the BJP-led NDA a “pro-rich” and anti-poor” government as he highlighted alleged scams and failures of the NDA government under the leadership of the present Prime Minister. Gogoi who first attacked the Modi-led government on the alleged scam in the Rafale deal for purchasing fighter jets from France, recalled the hardships and sufferings that the people of the country had undergone during the demonetization process, price rise and a host of other issues. “The PM conducted himself during the Rafael deal though he is not a defence expert. He (Modi) talked about protecting India but he managed to compromise the defence security by reducing 126 jets to 36 and compromised even further by giving contracts related to these fighter jets to an inexperienced company. In 2014, the NDA came up with the land bill to take land from farmers, followed by the Lalit gate scam in 2015. The demonetization exercise in 2016 was supposed to be an attack on the corrupt, but it benefited the corrupt. Young people continue to be unemployed and frustrated. Our society which is known for pluralism and for unity and diversity is being divided and fractured by the BJP,” Gogoi rued. The Congress leader also asked the NDA government not to be afraid of the Joint Parliamentary Committee to probe into the Rafale deal.